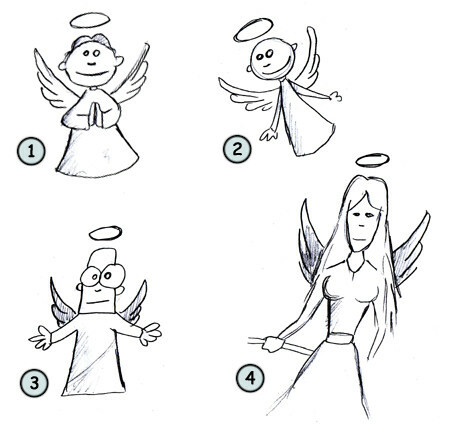 Drawing a cartoon angel: some fun facts before starting sketching! About half of Americans are convinced that angels really do exist. Angels are present in many religions around the world. 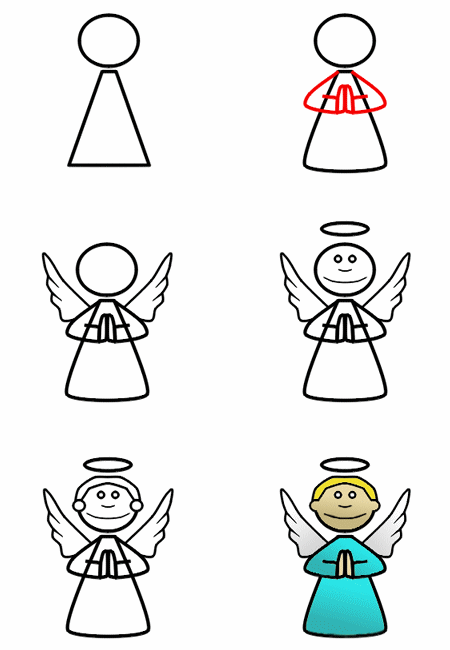 Learning how to draw an angel is really not a big challenge if you already know how to draw human figures. 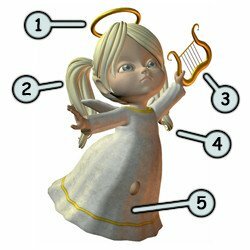 They have an aureole on top of the head (1), wings on their back (4), long hair (2) and a light robe (5). They also play music with a harp (3). An angel might fly above the ground, so the feet are usually hidden. Let's take a closer look at the shape of this cute angel. In this example, for a better overall view, I did not draw the hair of the character. The body is made of a big triangle (with round edges). The head is made of a circle while the arms are drawn with rectangles. The wings are represented by two small triangles. In this case, the harp is sketch with two small lines. The aureole is made with a simple circle. 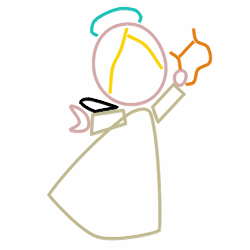 It's time to try to draw a simple angel. First, sketch the head with a circle and then draw the body using a triangle. Work the outline of the body a little bit and then sketch the arms and the hands of your angel. Next, draw the wings of your character (you can use triangles to guide you) and add details like the mouth, the eyes and the aureole. Finish your work by sketching the ears and the hair. For a more professional look, you can also add colors. You can draw your angels any way you want to. It can be a funny one (3), a very cute one (4) or a simple one (2). Just remember to draw a long robe, an aureole, a couple of wings and a harp to help your creation look like a real angel. Have fun!